I have owned three pairs of sneakers in the past 15 years. This is one of them. Scroll up to see the third pair, bought late last year after I started running. There’s no denying that runners need great shoes. Expert types say sneakers should be replaced every 350-400 miles, depending on how hard you run. Considering my rate, current achievable distance, and tendency to walk when things get tough, that’s good news for my footwear budget! But I have never had a proper sneaker fitting. And I figured if I am going to continue to masquerade as a runner, I should at least do it in appropriate trainers. I have a hunch that my old method of shoe selection – “I’ll take the pink ones” – was slightly flawed. So Hubby and I visited Marathon Sports in Norwell, MA, along with members of his YMCA marathon training group, for a shoes/winter running apparel clinic (we had the store to ourselves!). Fascinating stuff. I thought I learned how to dress myself when I was little, but it turns out I know nothing. We both had a gait analysis, which involved striding in socks across the store so the analyzer could observe what was going on with our tootsies. Over-pronators are prone to injuries such as Achilles tendonitis, arch pain, knee pain, and hip and lower back pain. One of these I am very familiar with, and the others just sound nasty, so I figure I had nothing to lose by investing in a new pair of shoes. 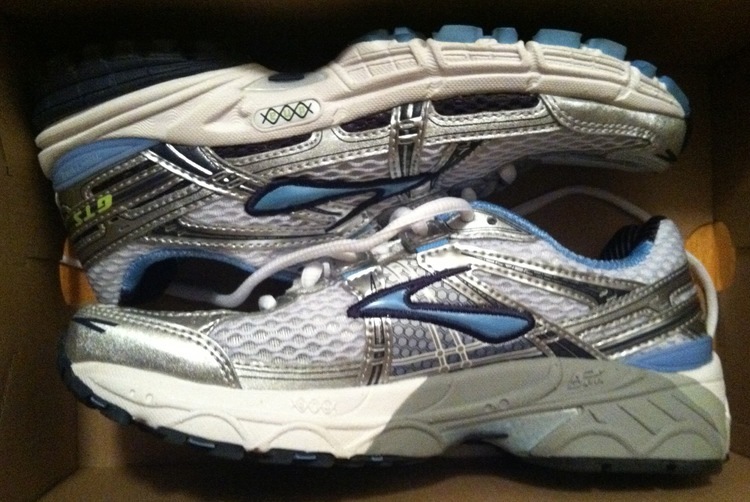 My new Brooks sneakers. The gray bit on the inner rim is the extra stability to stop my feet from rolling inwards. Because I am an over-pronator (sadly, not quite the same thing as an overachiever), I need shoes with extra support at the inner arch. So no minimalist footwear for me (and I was so hoping to move on to those freaky sneakers with the toes). After trying on a bunch of different models and testing them on the in-store treadmill (excellent idea), I settled on the Brooks Adrenaline GTS 11 for no other reason than they were the most comfy. Some of the prospects felt like they were giving my foot a wedgie (riding up the back), others like I was teetering on five-inch platforms (I don’t do heels). I was sad they weren’t pink, but I’ll get over it. They certainly look fast. Although I fear, as with my CW-X tights, I can’t possibly live up to their awesomeness. Stay tuned to see whether or not I do. I am a sucker for clever design and marketing, and the box the shoes came in was so cute, I thought it deserved a shout-out. Herewith (part of) the lid and under the lid. See what I mean? 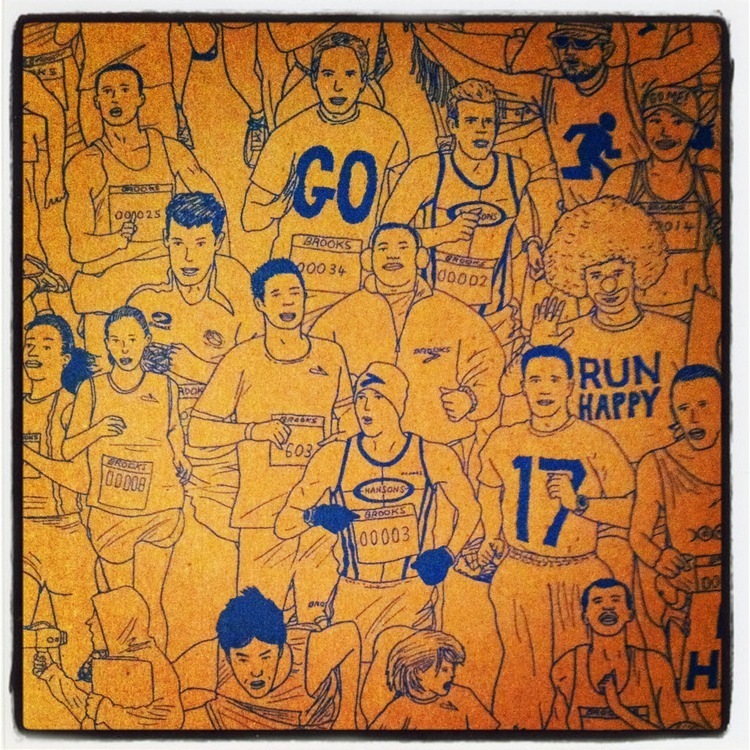 This entry was posted in Fitness, Humor, Running and tagged running apparel, sneakers. Bookmark the permalink. I also got fitted at Marathon Sports, am also a mild overpronator, and also have the same Brooks Andrenaline GTS’s. That’s a lot of also’s! Ha. At first I was suspicious of this over-pronation business, but once I did the research and discovered how common it was, I guess I came around. And it’s not like I wouldn’t have bought shoes anyway! 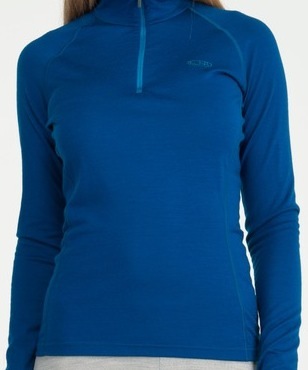 I do like the folks at Marathon Sports. I run the same way! My friend works at Mizuno so I was able to get a sweet discount! Ooooh, lucky! Hubby is absolutely obsessed with those, but they’re a bit out of our range at the moment. They’re his dream shoes. While you’re faced with running info overload, have you (or your husband) looked into barefoot running? Many foot injuries came about AFTER the invention of the running shoe…bringing the increase in foot injuries which are why many non-runners think running is dangerous or unhealthy. The fact is that a shoe will never be able to “fix” things like pronation, which to a great extent is a natural part of running; the best is to find a shoe that has as little padding as possible (not many ‘barefoot’ runners actually run barefoot, a lot of us wear fivefinger shoes or another minimalist shoe). Wow, this is a long comment. I hope you look into it, though, and while you’re at it, the book Born to Run is full of great info about running, barefoot running, and the human body in general. Sweet! I hope I love mine too. I’ve only taken them for one run so far, so I need to break them in a bit more, I think. Yay for gait analysis! I hope that it helps you and that your tootsies are happy in their new home. I recently changed to this shoe and like it a lot! I also pronate and I was looking for something really light and minimalistic. I like the fact that they weigh next to nothing and I can run on the balls of my feet. Glad so many people seem to like this shoe! I’m with you on how light it is. I like that it weighs little but still offers that stability. I haven’t quite figured out my technique yet. Maybe these will help! you should try some minimalist shoes anyway. They will make your feet stronger so you won’t need shoes for over-(or under) pronating as much. I definitely will. I may try alternating something more minimalist with these ones to ease myself in. Thanks for the tip! 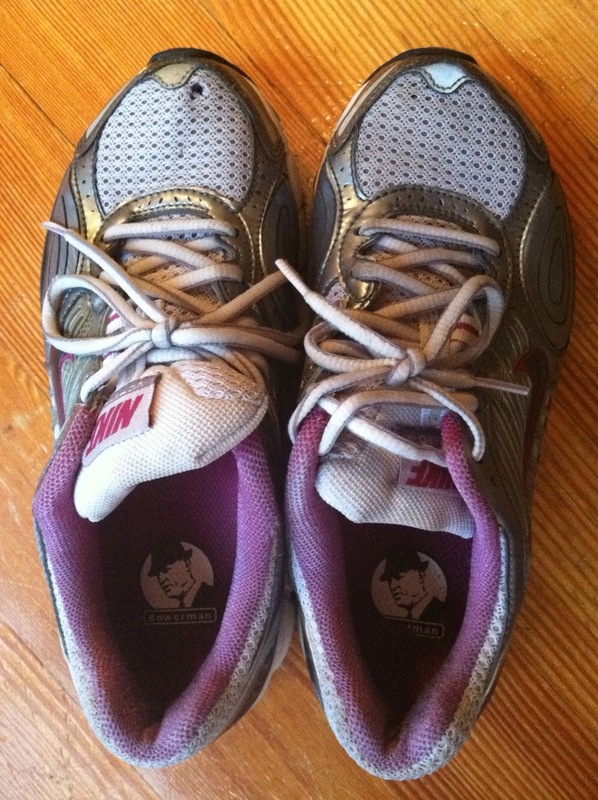 My last 2 pairs of running shoes have been brooks. I love them. They are comfortable but not as cushioned as Asics which make me feel like I’m running on a pillow, sounds comfy but is weird. I agree about the box too! Good luck! 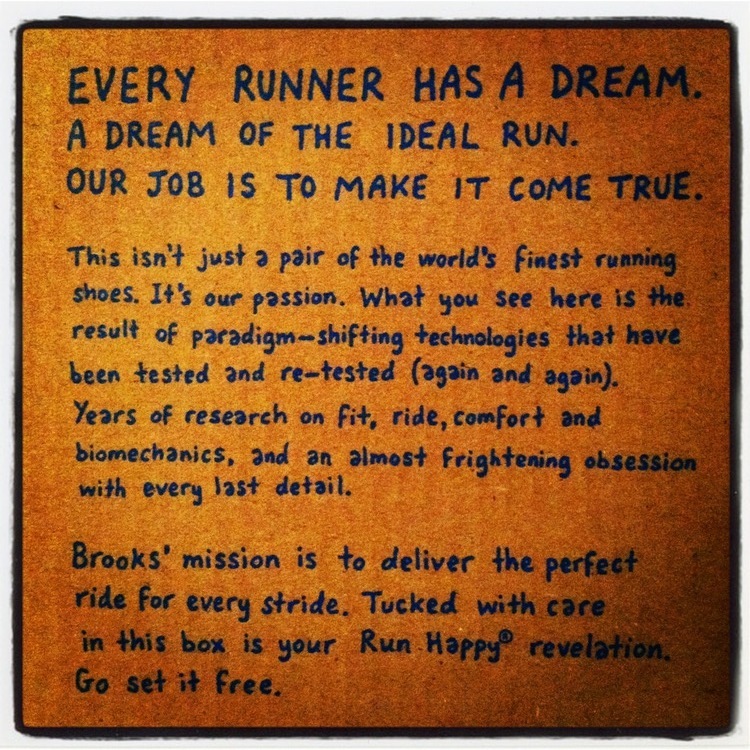 Brooks Adrenalines made me into a runner–if I didn’t have them, I don’t think I would have ever started running happy! I love the part about the Run Happy revelation. 🙂 I want a box like that one! Say so long to Pretty kicks… u have to be kind to your feet and get the proper shoe now that u know better :). I’ve longingly coveted a cool pair of nikes knowing that they were never to be mine…as cool as they look they just don’t fit and sadly I must choose the right pair that fit not the ones the little fashionista part of me wants. Happy feet make for a happy body. Good choice!! !